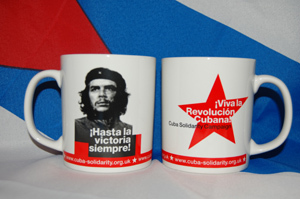 Our Che Guevara mug – designed exclusively for CSC – features the classic Che image, ‘Viva la Revolucíon Cubana!’ slogan, star and CSC website. Red and black print on white mug. Dishwasher safe. And only £6.60 inc P&P from our online shop. 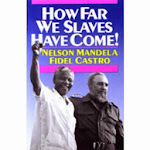 Although Che preferred a hot drink of mate, why not get a packet of delicious Cuban coffee to go with your designer mug?